I made the decision to become a soldier very early in life. I was deployed to fight in a war before I was of a legal age to even drink in the U.S. Much of my life has been spent thinking about the decision I made so early in life to become a soldier, and what that meant. One thing that I’ve come to understand as a book writer is that it often takes a book length project to satisfactorily answer the important questions I have in this life. 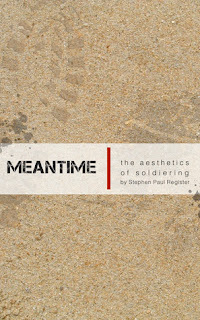 MEANTIME is one big answer to the question I’ve been wrestling with for nearly a decade: What did it mean for me, my family, my friends, and my society in the decision I made to become a soldier. 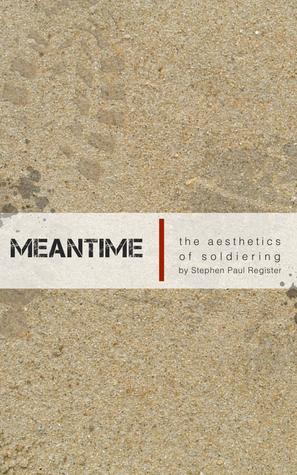 Can you tell us a little about the structure of MEANTIME and why you chose it? I see the soldier’s role as one that is primarily aesthetic. So I’ve broken the book into four chapters that explore, to me, the comprehensive aesthetic of a soldier, starting from the most basic category (the uniform [i.e. costuming]), to the most complex (performance in theater [on stage]). Within each chapter there are different vignettes. I’ve thought of these different vignettes as epodes, strophes, essays, or (metaphorically) songs on an album. Each vignette can stand on its own, but it has more meaning when compared to the vignettes that surround it. The vignettes are not arranged chronologically. I chose to do this because I believe this is how memory works: one does not remember events chronologically most of the time; most of the time one memory triggers another memory from a very different time and place in one’s life. So, my book, in that it is organized in small vignettes that are not chronological, is also a commentary on memoir and on memory itself. What was the hardest part about writing your memoir? Finishing it. It is the hardest thing I’ve ever done because it took every ounce of my being to complete it. Day in and day out I sat for hours upon hours in front of a computer screen grinding this thing out. And I didn’t even know what the book was about until it was nearly finished. So, yeah, the hardest part was sticking with it and getting it done. The book took me eight years to write, and a very focused eight months to finish it. What is your biggest distraction while you are writing? If you could choose only one thing for your readers to take away from MEANTIME, what would it be? When a person decides to become a soldier they make the decision to be a killer of people. The job, at a fundamental level, is to take human life. No matter which way you spin it, whether you talk about defending freedom or dying for your brother, the job, at the end of the day, is to kill people. I just want readers to realize what they are asking of a person when they ask them to be a soldier. Soldiering is a job, just like being a butcher or an electrician or a lawyer. Soldiering is just a very, very difficult job, often with very traumatic repercussions. I might actually be willing to say that soldiering is the most difficult job in our society. But there is very little glory in it. It is a tough and scarring job, even if you make it out with all your limbs. And I just want people who are considering the option of becoming a soldier to know exactly what they’re getting into. You are also a poet, with a few samples of your work on your website. Will you be releasing a compilation of your poetry in the future? Maybe some time in the future. I wrote poetry all through my twenties because there were moments when I just needed to write, to create art, to do something cathartic. What I’ve come to realize, though, is that I’m more a writer of books than poetry. I wrote poetry because I had to, because I wasn’t writing books. When I’m writing a book, though, I rarely feel the need to write poetry. To me my books will always be one big poem. Who knows what the future will bring; I may find my way back to poetry. But, as it stands, I am using all my energies to create stories and write books. I don’t really have any energy to give to poetry at the moment. Do you have any other future projects that you can tell us about? I’ve got about seven fiction books lined up. The first one is about a guy who goes to Europe and gets into all kinds of craziness traveling from Germany to Scotland. The philosophical bedrock of the text will be an exploration of alterity. But the actual story is going to really wild, really fun. The next book after that will be about a college men’s track team and what it means to be an athlete and compete. Like I said, I have many more books in the work than just those two, but I don’t want to show all my hand at once.